Bill has served in a variety of capacities in the Fidelity organization. Previously, he was Executive Vice President of Black Knight Financial Services, leading the Office of the Enterprise. Prior to that, he was Executive Vice President of Sales and Marketing for Lender Processing Services. He also served as President and CEO of Lender’s Services, Inc. prior to Fidelity’s acquisition of LSI in 2003. Over the years, he has built a strong foundation of strategic partnerships throughout the industry and has developed an extensive background in sales, marketing and operations. Bill has more than 45 years of experience in the mortgage finance and financial services fields. He began his career in mortgage finance in 1972 with C&S National Bank in Atlanta. In 1975, he joined Ticor Mortgage Insurance where he spent nine years serving in a variety of roles. His senior responsibilities included serving as the Executive Vice President responsible for Operations, including national sales and marketing, secondary marketing, information systems, and insurance underwriting. From 1981 to 1983, he served on the company's Board of Directors. In addition, he founded and acted as President and CEO of Ticor Securities Company, a firm specializing in the structuring and sale of mortgage-backed securities. In 1984, Bill moved to Dallas, Texas, where he was founder, Chairman and CEO of the Highland Park National Bank and its mortgage subsidiary, the Highland Capital Group. In 1987, he co-founded and was a partner with the Stratmor Group, a privately held investment banking firm that specialized in facilitating mergers and acquisitions to mortgage banking firms. Throughout his career, Bill has been active in professional, community and civic organizations. 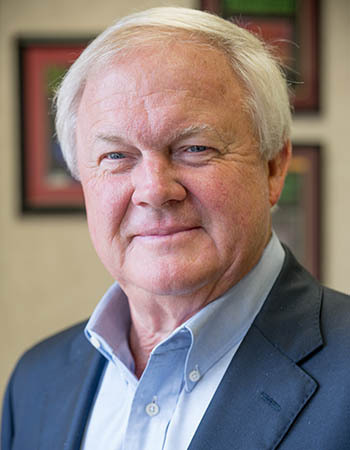 He serves on the Board of the Dean’s Advisory Council for the Terry College of Business at the University of Georgia and was Chairman from 2010–2011. Bill served on the Building Terry Campaign Cabinet which helped in raising over $120 million in private funding for the new Terry College facilities. He received the Distinguished Alumni Award from the Terry College in 2007. Bill served on the Board of Trustees of the University of Georgia Foundation from 2007-2017. Additionally, Bill is Chairman of the Board of Aruna Biomedical, a bio tech company based in Athens. In Pittsburgh, he served on the Board of Governors of Oakmont Country Club (2003–2011) and was President (2004–2010) when Oakmont hosted the 2007 United States Open Championship and the 2010 U.S. Women’s Open Championship. Bill also serves as President of the Fownes Foundation at Oakmont and serves on the Board of Landmarks Development Corporation, a subsidiary of the Pittsburgh History & Landmarks Foundation. While in Dallas, Bill was the chairman of the National Craniofacial Foundation. Bill earned a bachelor’s degree in business administration from The University of Georgia in 1972.